ENJOY IT ENJOY IT... I made some extra controls C V B and M to change the tracks on ANY FRAME... but hte game goes fast you may only be able to enjoy it on the last frame... it will probbaly crash when you restart it but that's part of things.. It's hard to go back, but it can't be that hard to enjoy... Here's a picture of ray for the screenshot, he's not in it but here's a g; for him. Thanks effbee for the input and troubleshooting on the explosion that disappears.. I put a lot of work getting this TGF2 compatible. Not a LOT LOT but a little less than lot lot. More description at the link of course, but yeah hit it, rate it here/there, it's under classic judgement. Edit: the link at the bottom didn't work for me so I moved the "upload" to the right event. 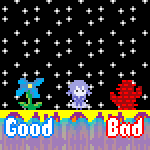 This is kind of a warm up since it's been awhile since I've made a game. Press Z to fire at dinos. Man I wish I had time to do sound. I should start with sound. It's the Best Game Ever! Play it now! It's got a pirate, and a kart. Let your frustrations out with Pirate Punch! 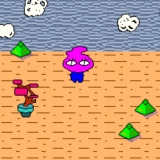 Punch the pirate and eventually kill him by clicking on him with yer mouse. Arrr.